Maybe I’m not a great man but I damn well want to break the record. Former Major League outfielder Roger Maris passed away on December 14, 1985, following a two-year battle with lymphatic cancer. Whitey Ford, Mickey Mantle, John Blanchard, Bill Skowron, Whitey Herzog, and Bob Allison served as pallbearers at his funeral. Most baseball fans are familiar with the name Roger Maris. Those who paid any attention to the home run race of 1998 definitely have a familiarity with the name, because from 1961 until 1998, Roger Maris held Major League Baseball’s single-season home run record. Roger Eugene Maras was born on September 10, 1934 in Hibbing, Minnesota, the son of Rudolph S. “Rudy” and Corrine Maras (Roger would later change his last name to “Maris”). Roger also had a brother, Rudy, Jr., who was older by a year. In 1942, the Maras family moved to Grand Forks, North Dakota, then onto Fargo, North Dakota in 1946.
changed his mind in favor of staying close to his brother, who had been diagnosed with polio. Maris instead decided to pursue a baseball career, and at the age of 18, he signed with the Cleveland Indians, starting out with their Fargo farm team. After a few years in the minors, Maris made his Major League debut on April 16, 1957 playing outfield for the Indians. Halfway through the 1958 season, he was traded to the Kansas City Athletics. He recorded 28 home runs during the 1958 season, then in 1959, he represented the A’s in the All-Star game. However, he missed 45 games during the 1959 season due to an appendix operation and only hit 16 home runs. In December 1959, Maris was traded to the New York Yankees, along with Kent Hadley and Joe DeMaestri. In the 1960 season, Maris hit 39 home runs, which was a career high for him at that time, and led the American League with 112 RBIs. He again played in the All-Star game, and the Yankees won the American League pennant. However, New York lost the World Series in seven games to the Pittsburgh Pirates. Maris won the Gold Glove award and was also named the American League’s Most Valuable Player. In 1961, Major League Baseball extended its season from 154 to 162 games. When the season started, Maris started out slow, but he hit 11 home runs in the month of May and another 15 in June, putting him on pace to reach the single-season record of 60 set by the Babe Ruth in 1927. As mid-season approached, it seemed wholly possible that either Maris or fellow Yankee Mickey Mantle, if not both, would break Ruth’s home run record. The media focused intensely on the home run chase, fabricating a rivalry between Maris and Mantle that didn’t actually exist. Very much an introvert, Maris grew weary of having to talk about the record with reporters day in and day out, and his hair started falling out due to increasing pressure. To make matters worse, as the season progressed, there was much discussion as to what would happen if Maris couldn’t break the record within 154 games, some going so far as to say the record didn’t count if Maris couldn’t do it within those 154 games as Ruth did. The popular belief that an asterisk would be placed on Maris’s record if achieved after 154 games, however, was urban legend. Maris wound up with 59 home runs during that allotted 154-game time frame, and then Maris tied Ruth in game 159. He hit his 61st homer on the last day of the season. From then, until 1991, Ruth and Maris were acknowledged separately in the record books, just not with an asterisk. Maris also led the AL with 141 RBIs and 132 runs scored in 1961, winning the American League’s Most Valuable Player award once again. The Yankees went on to win the World Series over the Cincinnati Reds, four games to one. In 1962, Maris compiled 33 home runs and 100 RBIs and he was named to the All-Star team for the fourth consecutive year. The Yankees repeated as World Series champs, this time defeating the San Francisco Giants, four games to three. In 1963, Maris played in only 90 games, hitting 23 home runs. He also missed much of the World Series due to injury. In 1964, Maris made a bit of a comeback, appearing in 141 games and batting .281 with 26 home runs. His play continued to decline after that season, however, and in 1966, the Yankees traded Maris to the St. Louis Cardinals. Maris played his final two seasons with the Cardinals, helping them to win the 1967 and 1968 pennants. While the Cardinals won the 1967 World Series, they lost a very close 1968 Series, four games to three, to the Detroit Tigers. Maris retired from baseball after that season. His playing days behind him, Maris and his brother owned and operated Maris Distributing, a Budweiser beer distributorship in Gainesville, Florida. Maris also coached baseball at Gainesville’s Oak Hall High School, which named its baseball field after him in 1990. On July 21, 1984, his jersey number 9 was permanently retired by the Yankees, and that same year, the Roger Maris Museum was opened in the West Acres Mall in Fargo. In 1983, Maris was diagnosed with Non-Hodgkin lymphoma. He died from the disease in Houston, Texas, on December 14, 1985. He was buried at Holy Cross Cemetery in Fargo, North Dakota. 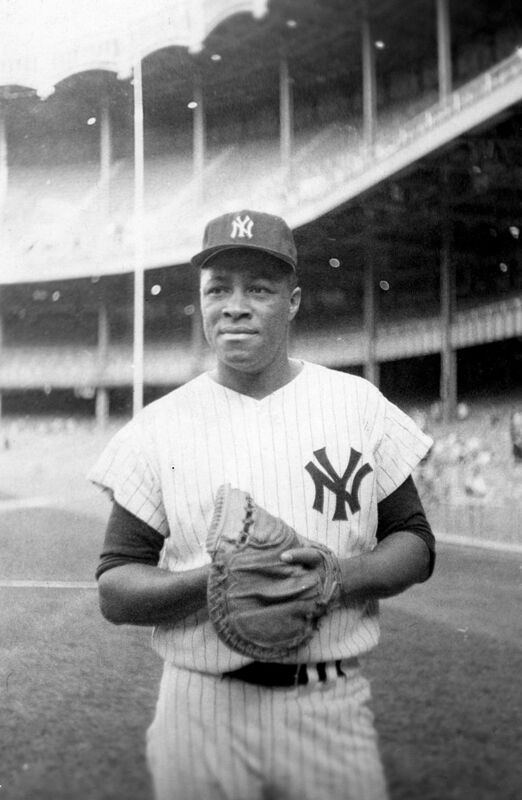 On November 7, 1963, Elston Howard was named the American League’s Most Valuable Player, making him the first black player to ever receive the honor in the AL. He also became the third consecutive Yankee to receive the honor, after Roger Maris (1960 and 1961) and Mickey Mantle (1962). On September 26, 1961, Yankees outfielder Roger Maris hit his 60th home run of the season to tie Babe Ruth’s 34-year-old single season record. Since the homer came in the 159th game of a newly-expanded season, however (previous seasons had 154 games), baseball commissioner Ford Frick determined that Ruth would remain the single season record holder.